Former Mudhoney guitarist Steve Turner's second solo record is a lot more realized, in some ways, than his debut. Whereas his debut, Searching for Melody, found the guitarist writing, playing, and singing together for the first time, keeping it sparse and organic, his latest, And His Bad Ideas, finds friends helping to embellish and fill out the songs. The result is a lot more lively, more rocking offering, but one that is still as too-the-gut and real as his debut. Steve Turner described Searching for Melody as "skate-folk". If that's the case, And His Bad Ideas may be described as "skate-bar-rock-folk", as a song like "Zero On The Scale" proves. With roots-rock deeply embedded in the song, Turner offers up a bar-rock jamboree, recalling the great legends of American rock music in the process. Equal parts Chuck Berry, Elvis Presley, and more, Turner has creates a loud, energetic song that will get you up and dancing, at the very least. "I Want You In My Arms" explores blues, offering up a blues-rocker, while "Dimebag Blues" goes even rootsier, exploring country-blues. Then there is "Painting A Picture", mixing things up with equal parts AM pop, folk, and muddy blues. "I Love The Sound of My Guitar When It Sings" is another example of Turner rocking out, offering up an alt. country number that will have you shaking your hips and singing along. One of the standout tracks on the album is "Someday Baby", which features Miss Holly Golightly dueting with Turner. 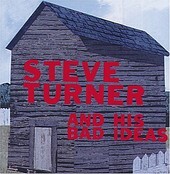 If "Painting A Picture" was Turner exploring AM pop, here is where Turner downright delves into it. Ending on a sparse note, the acoustic folk of "Move Ahead" helps you wind down and ends the album on a beautiful note. Turner may have expanded the instrumentation for his second full-length, but in doing so he has been able explore more music styles, making And His Bad Ideas more realized and more complete than his debut, which is saying a lot. Here is a record of beauty and knowledge, the type of record you wouldn't expect would come from the guitar player of a grunge band. Simply put, if Searching For Melody surprised you, your jaw will drop when you hear And His Bad Ideas. I'll give it an A-.